Custom stamping metal up to 12" x 12" flat. Custom stamping metal in thicknesses from .005" to .190". Custom stamping plastic up to 5" x 7" flat and in thicknesses from .005" to .125"
Boker’s is a custom stamping manufacturer of custom parts and components manufactured from metallic and non-metallic materials to your specific requirements. 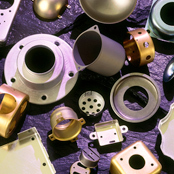 With over 100 years of experience Boker’s has developed the most efficient and effective methods for producing complex custom products from progressive dies and/or single stage tooling. 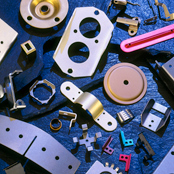 Boker's in-house tool department, wire EDM, 68 punch presses and years of experience provides the expertise needed to develop custom tooling and manufacture your most complex metal stampings. Whether it's flat blanking, piercing, metal forming, deep drawing or progressive stamping Boker's has the expertise to provide your precision parts. Custom parts and components can be produced from a material size up to 12" x 12" flat with a material thicknesses from .005" to .190". Draws can be produced up to 3" deep and 8" in diameter. Boker’s also provides all the secondary operations you would expect from your stamping manufacturer including deburring, tapping, reaming, counterboring, and spotfacing. Boker’s also has approved vendors for heat treating, plating and non-destructive testing (N.D.I.). To expedite your order and shorten delivery time, Boker's has immediate access to 2,000 commonly specified and hard-to-find materials including low carbon, cold rolled strip and sheet steel; SAE 1050, 1075, and 1095 spring steel; blue and black temper spring steel; low alloy steel sheets; brass; copper; nickel silver; beryllium copper; phosphor bronze; stainless steel; and aluminum. 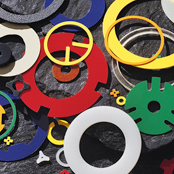 Boker’s also has the capabilities to stamp your flat non-metallic parts from a wide variety of materials including laminates, Fluoroplastics, Polyolefins, Polyvinyl Chloride (PVC) and Acrylonitrile Butadiene Styrene (ABS). 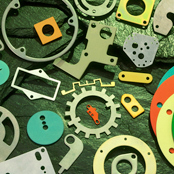 Plastic stampings can be provided in a range of sizes up to 5” x 7” (flat) with thicknesses from .005” to .125”. To obtain a quote on your next custom stamping project fill out Boker’s fast quote form and submit with your production prints.